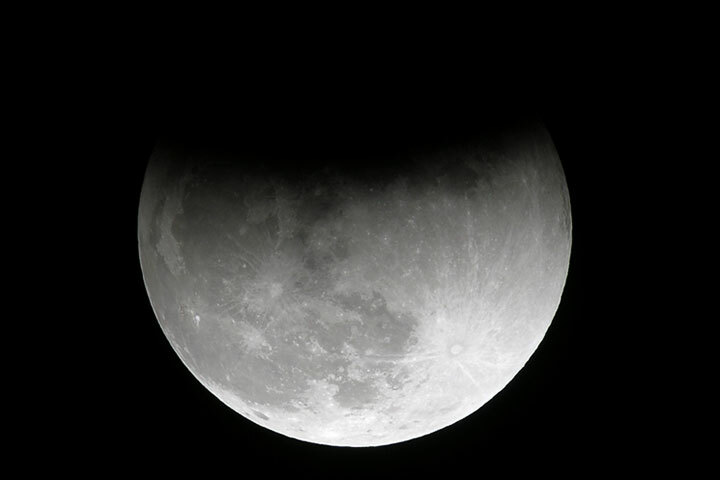 A lunar eclipse comes along every few years, but sometimes clouds block the local view, so good sightings are a bit rarer than astronomical tables might imply. Needless to say, when an eclipse takes place, and the air is stunningly clear (and even the lake is calm), it is an occasion to watch the grand spectacle. 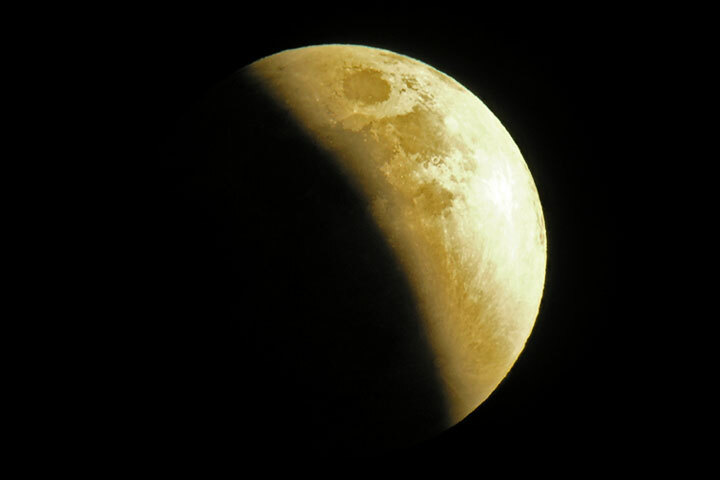 During a lunar eclipse, the Moon enters the shadow of the Earth. However, an understanding of the way the event unfolds is perhaps most easily accomplished by imagining that one is actually on the Moon watching it. From that vantage point, one would first see the Sun and the (dark side of the) Earth in the same part of the sky, with the Sun appearing somewhat smaller than the Earth. As the Sun begins to move behind the Earth, it gets darker where you are standing on the Moon’s surface. At the point where only part of the Sun is blocked by the Earth, you are in the penumbra. Soon, the Sun vanishes behind the Earth, and you are in the umbra. Yet, instead of becoming pitch black, something spectacular happens: the Earth becomes surrounded by a luminous, very thin, reddish ring—rather like a paper thin golden wedding band. This is sunlight that has been scattered by the molecules in the Earth’s atmosphere. The same process which creates the blue of the sky during the day (Rayleigh scattering), allows some of the longer wavelengths of light (the reddish end of the spectrum) to pass through the atmosphere and illuminate the otherwise dark Moon. As seen from the Moon, the Earth is surrounded by a thin ring of sunset skies; as seen from the Earth, the Moon is bathed in the light of gloaming. To earthbound observers, this grand parade is further augmented by the fact that they are looking up at the Moon through our own atmosphere. So when the Moon is low on the horizon, even the sunlit surface appears somewhat reddish, but when high in the sky it is whitish. The event is one of great experiential delight. Eclipse over Kootenay Lake This eclipse begins about the same time as the moon rises over the Lake (a happenstance of location). The bite out of the Moon from the shadow of the Earth can be seen on its lower left side. 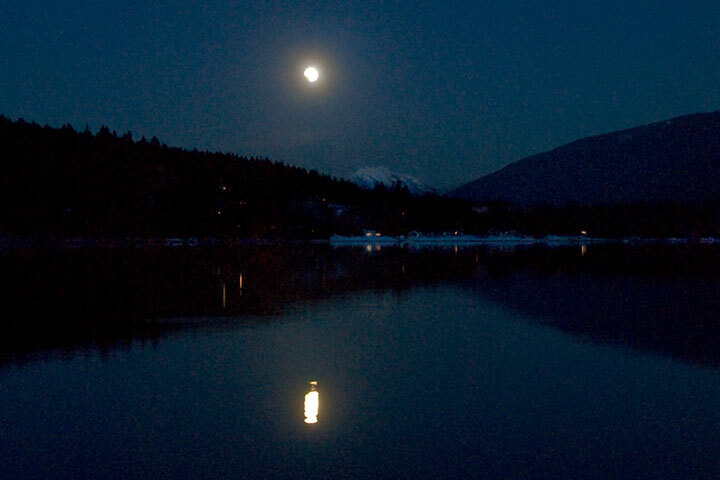 Even the reflection of the Moon on the water’s surface, albeit drawn out, has a nick out of it (upper left to match the lower left of the Moon). Sphinx Mountain in the Purcells can be seen in the distance. Entering The Moon is entering the Earth’s shadow—its penumbra. 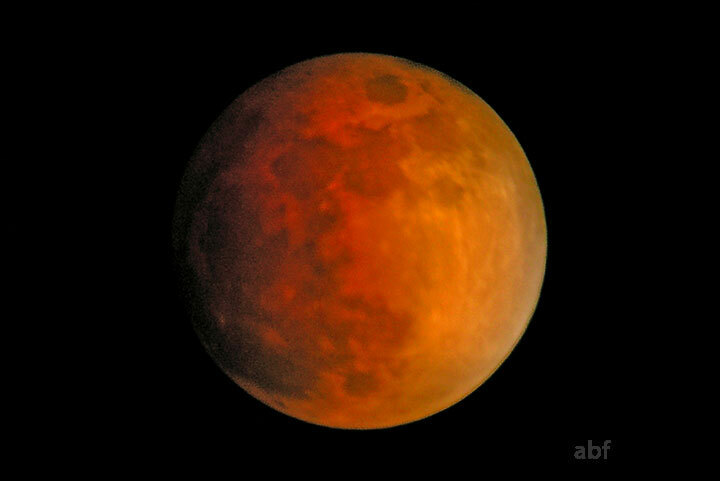 But, the Moon’s sunlit portion is reddish as the Moon is still fairly low in the sky. Leaving The Moon is leaving the penumbra. Now the Moon is high in the sky and the sunlit portion appears whitish. Totality The Moon is completely within the Earth’s shadow (in the umbra). So, why is there a (faint) light on it? This is the light which has been scattered (bent) into the shadow region by the Earth’s atmosphere. The golden colour can be thought of as the light from all the Earth’s sunsets rolled into one.